Calling a crime novel “cinematic” usually means that it’s graphic, with lots of scene changes and action. Corneliu Porumboiu’s new Romanian film Police, Adjective (which ran here recently in the E.U. Film Festival and is now in a few theaters and on pay cable) turns that notion of cinematic, as well as the structure of the police procedural, on its head. The plot of Police, Adjective is minimal, there are mostly long, quiet and nearly static camera shots, and the story is told almost entirely visually in the beginning (in perhaps a more genuine sense of “cinematic”)—in slow shots of uneventful surveillance, though at the end the structure flips over and the story is carried almost entirely verbally, in two written reports that the camera pans across and in two encounters at the very end in Cristi’s boss’s office (up to then Cristi has been avoiding the boss). 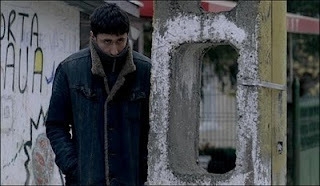 Cristi is a plain-clothes cop in a small city in contemporary Romania, assigned to do surveillance on a teenager who has been denounced as a drug dealer. But Cristi (and the viewer) only see the target walking back and forth from school and standing in a schoolyard with two friends (the denouncer and a girl) smoking. Several times, Cristi goes into the schoolyard after the 3 have left and scours the ground for cigarette butts, so he can test them for hashish, a telling instance of the lack of glamour and action in what Cristi’s life as a cop actually amounts to. Most reviewers remark on the patience required of the viewer: in one scene Cristi telephones someone who was supposed to meet him in her office at the police station, and she tells him she’ll be there in 10 minutes. After a moment of watching him standing in the hallway, we begin to fear that it will actually be 10 minutes before we see her arrive—an entirely different sort of “real time” than, for instance, Jack Bauer’s 24. The plot turns on the cop’s reluctance to bust the kid on a petty charge that will nonetheless send him for jail for up to 7 years and ruin his life. Cristi’s wife is a schoolteacher, who corrects his grammar when she happens to read his report, and the boss lectures Cristi pedantically (using a dictionary) on the meaning of “conscience,” “police,” and other words. So this very visual movie is about words, and how they have consequences (even how they create or corrupt moral dilemmas). One reviewer compared Police, Adjective to the more eventful (but still slow-paced) The Lives of Others, comparing the moral dilemmas of that film’s Soviet-era German setting to the post-Soviet, bureaucratic morality of the new film. The comparison is apt, but the slowness of Police, Adjective will probably prevent it from being as popular as The Lives of Others has become, but Porumboiu shows that a great deal can be accomplished with minimal means, if an audience is patient enough to follow his story through to the end.